Rising storytelling-poet Katie Keridan reaches out to her audience as she bares her soul in her unique work, Once Upon a Girl. 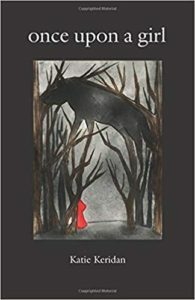 Perking the interest of readers from the get-go, Keridan will not disappoint her audience since her poems do much more than explain her seemingly dark writing style. While the outpouring of words, no doubt, reflect a painful past, Keridan chooses to let vulnerability and transparency be her guide as she peels back facades and exposes the truth about herself, her suffering, battling with low self-esteem, and the process she’s taken to reinvent herself. Keridan’s near 200-poem collection is exceptional on many different levels. Most prominent is her E.E. Cummings-approach to writing, which is marked with lowercase letters with minimal punctuation, and set to freeform with a light sprinkling of haikus. With no table of contents and very few titled poems, Keridan has the freedom to also reinvent her poetic approach, which functions more like a storytelling journey that chronicles her experiences. Much of Keridan’s poetry, like the opener mentioned above, have no titles and include commentaries which offer clarity to her poems that are replete with many low-self-esteem-related themes. While general topics cover relationships, love, marriage, others get more specific, such as abuse, bulimia, self-mutilation, stolen childhood, and unconditional love, to name a few. There are inferences, too, such as codependency in relationships. Plenty of metaphors are sprinkled throughout as well. One that stands out is fire, which Keridan explains in one of her commentaries as relating to her. A handful of poems that actually have titles made their first appearances in other sources such as “Soul Recognition” and “My Moment” in The Sand Canyon Review 2018, “The Truth of Always,” “Interludes,” and “Different and Never Enough” in Inquietudes Literary Journal 2018, “Hotel Room” in Madness Muse Press 2018, and “Space Between” in On Arrival through Eber & Wein Publishing. Quill says: Once Upon a Girl sends a powerful reminder that there is hope in the midst of hopelessness.